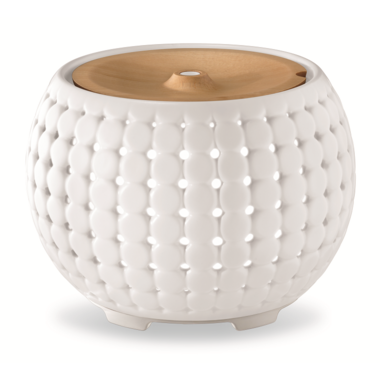 Ellia Gather Ultrasonic Aroma Diffuser delivers a fine mist of natural aroma to enhance your mood. The soothing humidity alleviates dry air. Turn on the colour changing light function for ambient evening light that creates a peaceful environment. Use the library of relaxing and uplifting sounds to relieve stress and ease your mind. Features convenient remote control functions that can be used from a distance. Up to 10 hours of continuous runtime and up to 20 hours of intermittent runtime. Includes 100% pure essential oil samples - Orange, Pay Attention, & Fight It. To turn on and off . Havet for 6 manths nov.
What a lovely product. I like how it comes with a remote to change the lighting or to switch diffuser settings. Thumbs up! A real treat for all the senses...will order another for my daughter's bedroom! This is a must have essential piece in every household and it makes the perfect housewarming gift - Pure Serenity. This a beautifulâ€‹ diffuser with all the extras. I love the remote control feature and sound options. My only concern is if I ever misplace the remote control, there are no controls on the diffuser itself. I purchase two, that in itself speaks volume. Pricey compared to other cheaper models and brands. These two are keepers, one in my bedroom and the other in my yoga/pilates studio room at home. 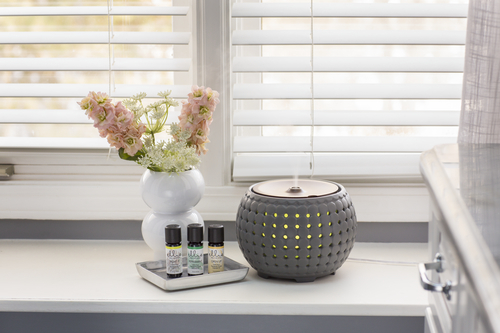 Beautiful diffuser, Love love love it! Love the remote feature for turning the diffuser off when already in bed. Great product. It helps my 93 year old dad with his chronic cough. Love it. Bought it for beside my bed, nice features, water lasts a long time, oils seem high quality too. This diffuser is beautiful, decorative ceramic. It is easy to use, with lots of great features. The sound feature is very relaxing, especially the ocean waves. The light alternates between various colours, but can be paused on the one you choose and also dimmed a bit. I highly recommend this as a compete relaxation tool. Beautiful diffuser! I have it in my living room. Recently purchased another one for a friend. Works great! This is a beautiful diffuser. It can be used simply to provide a steady aromatherapeutic mist, or as a complete relaxation tool, when you add the luminosity and sound features. It transforms our space into a full relaxation environment. Good quality, easy to use and refill/clean.